Here are a series of photographs of elm trees in Brighton and Hove. For anyone who is not aware, Brighton and Hove have some 30,000 elms; we are the holders of the National Collection for the Genus Ulmus (Elm) and have some of the country’s largest examples. The Weeping Wych elm (Ulmus glabra ‘Horizontalis’) in the Royal Pavilion Gardens, West Lawn by the Brighton Dome, is one of the finest left in the UK; it was a champ until others bigger were found. To the locals its one of the most popular trees. It was planted around 1900. The Preston Twins, Preston Park, Coronation Garden near the Manor House. These two trees measure 6.8m in girth circumference (hence the name Preston Twins) and are as much as 400 years old. They may have been part of a hedgerow, but now stand as singular pollarded trees. They are the world’s largest specimens of their kind. They are English elm (Ulmus minor var. vulgaris), this species was once very reknowned in southern England and featured much in paintings by Turner and Constable. The Brace Tree, West Lawn, Royal Pavilion Gardens. This tree has a distinct feature, an iron brace which is now part of the tree! 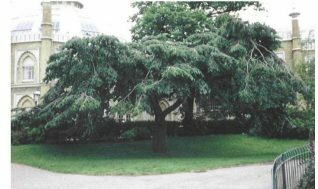 More fascinating is the fact that its one of the first planted as as an amenity tree for Brighton’s first park, The Promanade Grove, which has long since been engulfed into John Nash’s Royal Pavilion Gardens. The tree was planted around 1776 and has a girth circumference of 4.6m. Rare elms include Ulmus villosa from the Jammu Valley in Kashmir and as many as 100 Ulmus wallichiana (Himalayan elm) in the city. Crespin Way, Hollingdean, has many of these rare Himalayan elm as well as elms used in Dutch Elm Disease resistance tests. Such elms have no names just numbers, these include Ulmus ‘148’ and Ulmus ‘260’. Many council housing estates, such as Whitehawk and Moulsecoomb, have examples of these unusual clones. The West Ride line of Jersey elm (Ulmus minor ssp. sarniensis), averaging 29m tall and girth circumferences of 2m, were planted around 1880, roughly the time when the park was handed over to the public from the Stanford family. There are some 40 trees, with one Cornish elm (Ulmus minor ssp. angustifolia) at the north end. They are the World’s best example in a single lined avenue. Freshfield Road, Brighton, has one of the finest examples of Dutch Elm (Ulmus x hollandica ‘Hollandica’) roadside pollards. They, like other trees planted in nearby Elm Grove, were planted around the late 1800s. However the Elm Grove trees were twice replaced and now have a totally different species which were planted around 1950. These are like those on the West Ride in Preston Park, Jersey elm. A wood of Ulmus minor var exists amongst the Three-Cornered Copse in Hove. These trees are well into maturity and were obviously planted as the species is not common for this region. A very rare Purple-leaved Wych elm (Ulmus glabra ‘Atropurpurea’), which exists in Cottesmore St. Mary School in the Upper Drive, Hove, is a very tall example of this species. Naturally its the UK’s biggest. Queen’s Park has many fine examples of Wych elm (Ulmus glabra), which in general terms was not planted very much as a park tree. The English elm and Dutch elm were more popular. Powis Square is totally Wych elm. Wych elm is a common woodland tree in Withdean and has reached some considerable heights on the steep banks above Withdean Stadium. The Old Steine War Memorial would look very barren if it wasn’t for the elms which make up its entire population of trees. 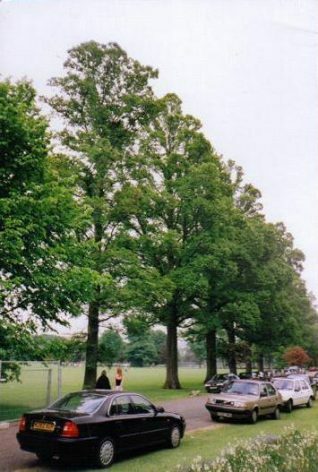 Other totally elm dominated areas include Marmion Road Park in Hove. There one species is dominant, the Huntingdon elm (Ulmus x hollandica ‘Vegeta’). This species is the city’s most common street tree as well. Hi Peter, I am a member of Sussex Butterfly Conservation and have recently volunteered to be species champion for the white-letter hairstreak butterfly. This probably under-recorded little butterfly feeds off elm and my first task has been to try and track down colonies around Brighton and Hove where I live. I found your item on elm trees in Brighton very helpful – especially as I have had some trouble actually identifying elm trees. I would be very grateful for any more info on elm in Brighton you might be able to help me with. Yesterday I saw my first adult white-letter hairstreak of the year flying high in the canopy of one of the english elms in Preston Park. Editor’s note: Hi Roddy – the best place to post a question is on our Message Board where it will be read by our many knowledgeable regulars. Fantastic information Peter! I’ve recently become quite an elm spotter and live near Preston Park so I’ve seen the twins and the numerous avenues of elms lining the streets in the area, but it’s great to hear of other particularly interesting locations in Brighton. There’s a facebook page for photos and elm news as part of a project that a charity I work for is doing, so please do let them know of sightings and news there. I’ve added a few of my Brighton photos there but they are quite limited in location (predominantly Preston Park). http://www.facebook.com/elmselmselms Also, if you’re up in London anytime, the project is working with the Natural History Museum to record surviving elms in London on an online map (there’s a link on that facebook page). I have some pictures on Flickr of the Preston Park Elms, which you’re more than welcome to use on your wonderful local history site. Since the message board is not on-line, I will leave a message here. Maybe directed to Peter Bourne. I live in Melbourne, Australia and we still have many elms here, of the green leaf type Ulmus glabra, Ulmus Minor, Ulmus procera, Ulmus x hollandica and Ulmus x hollandica Vegeta. Some years ago a tree database of Melbourne’s trees was established. Looking at the elms now, the list has Ulmus spp. as not enough work was done to ID them. I would like to get some help in a way to ID the trees out in the field. I have heard leaves and maybe bark is a way for identification? Looking for advise and help on this. A recent report which is open for public comment about the trees of Melbourne. The consultants are saying things like in the next 10 years a third of the street elms will need to be removed. It seems once a tree has reached 100 years, time to remove it. Our oldest elms are 150 years old and many around the 100 years and less. The tree planners are eager to remove tree avenues in our gardens because they are too old! I totally disagree but what a few people say will not matter as they have the report which they can fall back on, with nice photos, charts and graphs to prove their point. Hope we can save our trees! It might be a good idea to contact Brighton Council’s Arborculturists who hold the national collection and some have been part of the fight against Dutch Elm Disease since the 70s. They are the real experts and very helpful. Peter, My name is Joli McCathran and we have communicated previously about an English elm we have as world champion in Gaithersburg, Maryland. I am also a coordinator for the Maryland Big Tree Program. At the end of December I am coming to visit England and am wondering if I might be able to take a day trip to Brighton to meet up with you and see your largest elm? It appears the best date for me is Jan. 6, 2015. Please contact me via e-mail at kmccathran@verizon.net. Hoping we can meet.